With teacher appreciation week coming up I am busy making lanyards. 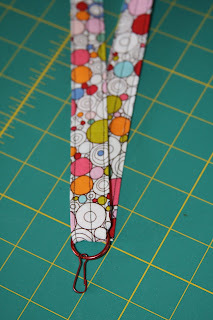 Last year I used this tutorial [http://sewsimplycreative.blogspot.com/2008/09/lanyard-tutorial.html], but I learned that the teachers at my kids' school are required to have a quick release on their lanyards. So this year I tried something just a little different. Cut a strip of fabric 3" by the length of the fabric, which is usually about 44". Fold short ends in 2" and press. Fold strip in half longways and press. Unfold and bring both edges almost to the middle pressed line and press in place. Now, fold it back in half and iron the whole thing really well. Sew a topstitch close to each edge of the strip and then a third stitch right down the middle. Slide on the hardware and bring it to the middle. Sew perpendicular to your stitching, as close to the ring as possible and then again 1/4" away. Cut two pieces of velcro, I like to round of the corners, I feel like it keeps it from lifting. I used Fabric Fusion velcro, its a little pricey, but I really like it. You can also use the sew-in velcro just as easily. Follow the directions on the package to apply velcro, or sew the velcro in place. And there you have it, a very cute lanyard for your favorite teacher. Awesome, I posted this to FB! Sweet! I love this! Thank you. This is great because any decent quality material would work and most people have something lying around. really great ideas for cheap xmas and birthday gifts too and a great creaft hobby to boot. A Little Irritation... The Death of Manners? This site is just for fun. All data and information provided on this site is for informational and entertainment purposes only. alittlegreat.blogspot.com makes no representations as to accuracy, completeness, currentness, suitability, or validity of any information on this site and will not be liable for any errors, omissions, or delays in this information or any losses, injuries, or damages arising from its display or use. All information is provided on an as-is basis. Any advice or information on this site should not be regarded as professional or expert.